5% Student Discount at Vision Direct Trouble with your eyes? Why wait, check out the great prices at Vision Direct and save more with your student discount! 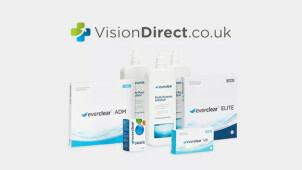 Find Eye Care Orders from £0.99 at Vision Direct Don't spend more than you have to on eye care! Enjoy eye care orders from £0.99 at Vision Direct. Discover Fresh Look Contact Lenses from £11.99 at Vision Direct Get yourself a bargain at Vision Direct with Fresh Look contact lenses starting from £11.99! Vision Direct has been operating since 1998 and is one of the internet’s most trusted online opticians. With over 700,000 customers under its belt and a Trustpilot rating of over 9.5, it’s truly earned its stripes when it comes to providing great service. For those looking for advice on ocular care, the eye care centre is full of useful guides on looking after your eyes and taking care of your lenses. The customer service team and in house optician are also available to ensure you get the most out of your lenses. Check out its blog too for hints and tips on the latest eyewear trends. You can also purchase spectacles and accompanying lenses, as well as lens solutions to keep your contacts performing well. Social responsibility is a big part of the Vision Direct brand, which is why it’s part of the Essilor group which has helped more than 6 million people across the world gain access to first-time vision care since 2013. Check out Vision Direct’s on-site promo codes to see if you could save! Does Vision Direct have a referrals programme? Yes, you could get money off your next order for every friend you recommend. See here for details. Can I get free delivery with Vision Direct? Yes on orders over £49. How can I pay with Vision Direct? You can pay with Mastercard, Visa, Maestro or PayPal. You can return your purchase within 100 days of receipt to receive an exchange or refund. Item must be unopened, in original condition and packaging. Contact customer services and then send product back, including a covering note identifying reasons for return. Terms apply. Full policy here. Loads of your shopping can be done online these days, and this now includes glasses and contacts from Vision Direct. As Europe’s largest contact lenses supplier, why not join thousands in saving up to 45% compared to the high street this summer? A Vision Direct promo code UK could save you money off your next order, so you can forget your glasses when you're out on the slopes this ski season, or simply going out for a summer stroll in the park. Cut the cost of living more when you buy your lenses with vouchercloud. You don’t even need to have your prescription to hand when ordering your contacts: you can enter all the details yourself! Vision Direct trusts you to know your own needs so you can manually enter the base curve and power of your order. If you have any questions, you can call the award winning customer service team who’ll talk you through the process or the in-house optician for any eye care or lens questions. Vision Direct is a great place to pick up those all-important sunglasses whether you’re hitting the UK beaches or heading abroad for some summer sun. With top brands available including Karen Millen and French Connection, a Vision Direct discount code could save you money on premium quality sunglasses. Your aviators, wraparounds or butterfly sunnies will look even better without having made a dent in your pocket – see the range for yourself!